point feature class of the points used to create the Digital elevation model (DEM) used as input below. Polygon feature class representing the extent of the survey. Polygon feature class representing areas not to be included in the bootstrapping. For example if a channel unit polygon feature class is used as input then the bootstrap will only be performed using points that exist outside of the channel unit feature class. Digital elevation model (DEM) that was created from the input survey points. grain size metrics are generally reported in millimeters so a conversion based on this value is performed to get values in millimeters. controls the number of times that points should be randomly sampled and differenced from the DEM. controls the percent of data that should be kept during each iteration to make a DEM to compare with the DEM provided above. 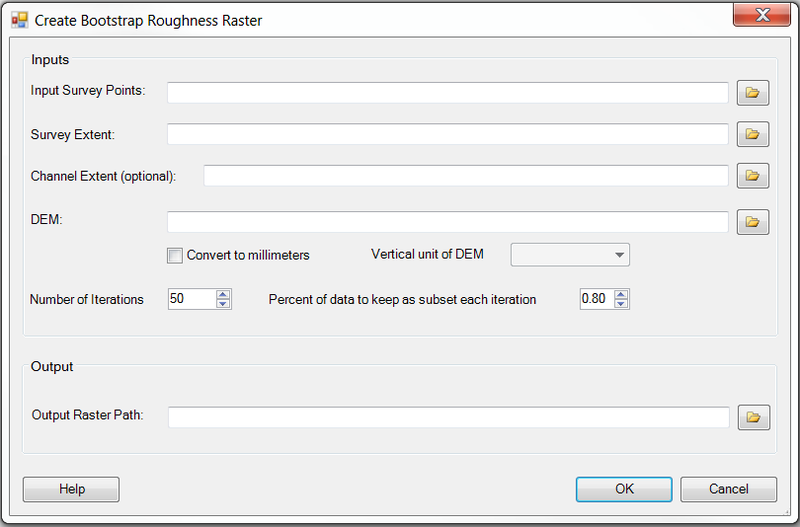 path to save the output bootstrap roughness raster to. The output raster is comprised of the mean delta Z between each iteration of sub-setting points and the original DEM.